FAQs - How to Keep the Chapter Info in the Converted File? Want to keep the chapters of your iTunes audiobook after converting to the DRM-free version? Here we will teach you how to retain the chapter info in the converted file by using iTunes DRM Audio Converter for Mac. Please download the latest verion of NoteBurner iTunes DRM Audio Converter first before getting started. Step 1: Launch NoteBurner iTunes DRM Audio Convert for Mac. 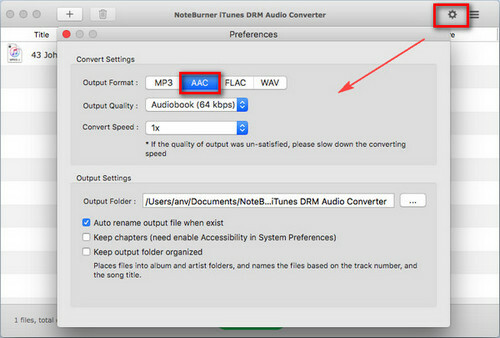 Click the menu bar "iTunes DRM Audio Converter > Preferences" or directly click button on the program interface, and then select the AAC as the output format. 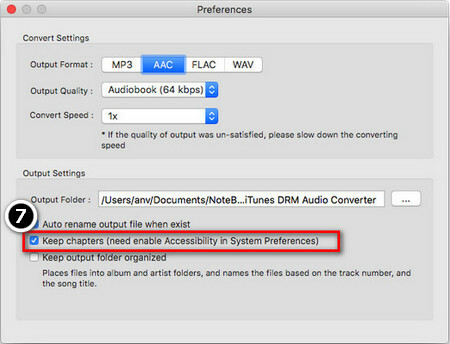 Step 2: Click the box that says "Keep chapters (need enable Accessibility in System Preferences)", and then a window will pop up, please click Open System Preferences. Step 3: Locate and click on the padlock icon on the bottom right side of the window and enter your admin password. This is necessary in order to make changes to the app’s permission settings. 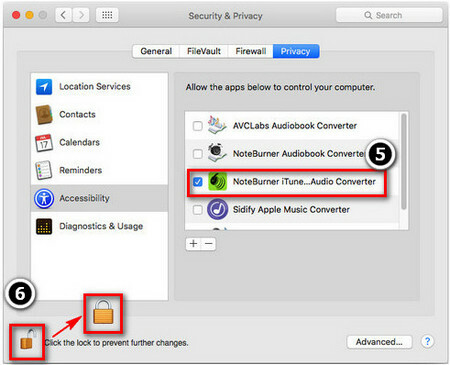 Step 4: After get the permission, please check the box of NoteBurner iTunes DRM Audio Converter, and re-click the padlock icon to prevent further change. Step 5: Finally, close the System Preferences window and click the box that says "Keep Chapter". Then you can add your audiobooks to the program and convert them with chapters kept.